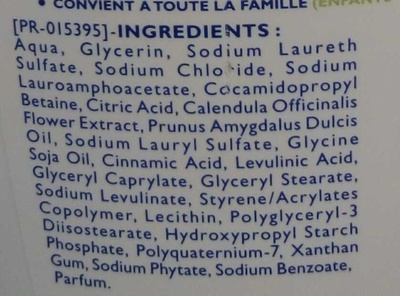 Aqua, Glycerin, Sodium Laureth Sulfate, Sodium Chloride, Sodium Lauroamphoacetate, Cocamidopropyl Betaine, Citric Acid, Calendula Officinalis Flower Extract, Prunus Amygdalus Dulcis Oil, Sodium Lauryl Sulfate, Glycine Soja Oil, Cinnamic Acid, Levulinic Acid, Glyceryl Caprylate, Glyceryl Stearate, Sodium Levulinate, Styrene/Acrylates Copolymer, Lecithin, Polyglyceryl-3 Diisostearate, Hydroxypropyl Starch Phosphate, Polyquaternium-7, Xanthan Gum, Sodium Phytate, Sodium Benzoate, Parfum. Product added on March 4, 2016 at 7:45:34 PM CET by sebleouf. Last edit of product page on May 20, 2016 at 11:46:30 PM CEST by .